It's a massive week for rankings this week, as the Japanese Grand Prix weekend appears to have brought out the more relaxed side of our drivers. We've got videos galore, of bursting balloons, folding paper, and sitting face to face with the BBC's Tom Clarkson. There's also points for messing about with a cherry picker, and being the man in the terrifying mask. Fernando Alonso and Daniel Ricciardo are essentially neck and neck as we head into the final stretch of the rankings season. There's still plenty of time for someone to catch up though, so do make sure you keep an eye out for anybody doing anything points worthy, and let me know! +3 Max Verstappen: Starting a friendly rivalry (for the moment) with teammate Daniel Ricciardo. +3 Daniel Ricciardo: Starting a friendly rivalry (for the moment) with teammate Max Verstappen. +2 Esteban Ocon: Epic jigsaw skills. +3 Lewis Hamilton: Not sure I totally agree with the ways and means of Lewis' press conference protest but can't argue with the message. +4 Daniel Ricciardo: Brilliant, brilliant reaction to being told he's no longer in the championship fight. +1 Daniel Ricciardo: Still being cheeky with some more teammate banter. +3 Kevin Magnussen: Nice little Q&A on the BBC, with reference to Hamilton's hair and being confused with Marcus Ericsson! +1 Nico Rosberg: Being his own cameraman and lighting crew! +2 Nico Hülkenberg: Points for admitting that current F1 strategies can make your face collapse! +1 Daniel Ricciardo: Getting a bit emosh referencing the fun of being in Japan. +1 Nico Hülkenberg: Managing a very respectable origami swan, and making fun of Checo along the way. 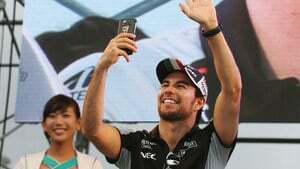 +1 Sergio Pérez: Going for speed over substance, as perhaps an F1 driver should, with his origami efforts. +5 Lewis Hamilton: He had quite the weekend of it, Lewis, but at least he had a little bit of fun, at Crofty's expense. +2 Jenson Button: Still showing the fans a good time even when being the man behind the mask. +1 Daniel Ricciardo: Fun little video bursting balloons, I can think of a better way though.